Voters cast their ballots in Cumberland, Rhode Island. Bernie Sanders has won the Democratic presidential primary in Rhode Island, offering the Vermont senator modest gains in the race against front-runner Hillary Clinton. Sanders’ win Tuesday blocks a potential sweep of the day’s five races by Clinton, who has already won three out of the five contests. But the former Secretary of State entered Tuesday’s five primaries having already accumulated 82 percent of the delegates needed to win her party’s nomination. While she can’t win enough delegates to officially knock Sanders out of the race this week, her gains could make it virtually impossible for him to catch up to her in the remaining contests. 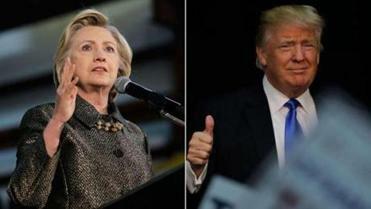 Trump’s and Clinton’s wins propelled them ever closer to a general election showdown. There are 384 Democratic delegates up for grabs in Tuesday’s races in Delaware, Maryland, Pennsylvania, Connecticut and Rhode Island. Donald Trump has won the Republican presidential primary in Rhode Island. The New York billionaire handily beat GOP contenders John Kasich and Ted Cruz after his campaign had aimed to win over independent voters who make up half the state’s electorate. 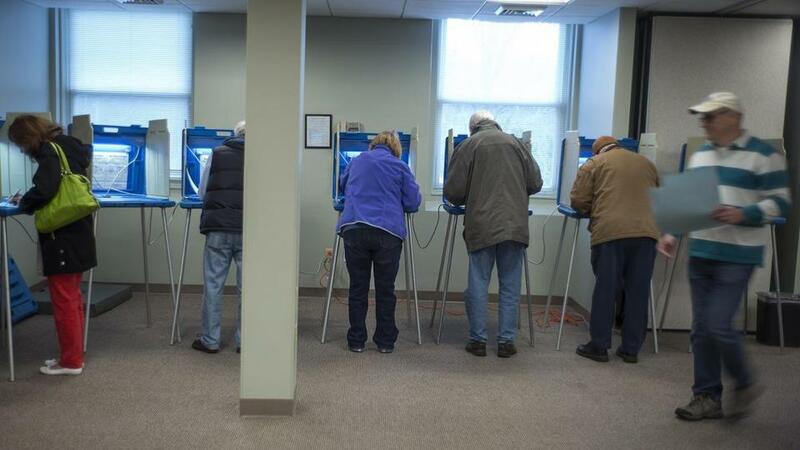 It was the only one of the five states holding primaries Tuesday where unaffiliated voters could choose the Republican or Democratic ballot. Trump rallied hundreds of Rhode Islanders on the day before the election at a Warwick hotel. It is not yet determined how many of the state’s 19 GOP delegates he will win. They are allocated proportionally. Polling places are closed in Rhode Island’s presidential primary. The polls closed at 8 p.m. Tuesday. Elections officials and voters reported turnout was steady at some polling places and was higher than expected at others. Block Island had to get a shipment of ballots brought over by ferry after nearly running out of ballots in the Democratic primary between Hillary Clinton and Bernie Sanders. The two are competing for 24 of the state’s 33 Democratic delegates. On the Republican side, Donald Trump, John Kasich and Ted Cruz were competing for 19 Republican delegates will be chosen. A ferry carrying presidential primary ballots has arrived to Rhode Island’s Block Island after a heavy turnout caused the remote community to run out of Democratic ballots. Town Clerk Molly Fitzpatrick says the island was down to just seven Democratic ballots by the time the boat arrived shortly after 6 p.m. Tuesday. Fitzpatrick credits the ferry captain and poll workers in the mainland town of Narragansett for saving the island’s election. Narragansett Town Clerk Anne Irons says she drove 100 extra Democratic ballots from a polling place to the Port of Galilee, where a captain was holding the day’s last ferry for them. Fitzpatrick says turnout in the Democratic contest between Hillary Clinton and Bernie Sanders was unexpectedly high. A ferry is rushing presidential primary ballots to Rhode Island’s Block Island after an unexpectedly heavy turnout caused the remote community to run out of Democratic ballots. Town Clerk Molly Fitzpatrick says a ferry captain and poll workers on the mainland are helping to save the island’s election. The island’s only polling place opened at noon Tuesday and was down to just 29 of its 300 Democratic ballots just before 6 p.m. Polls close at 8 p.m.
Fitzpatrick says the island’s air strip shut down for the day so the state Board of Elections helped get extra ballots to a ferry station in Narragansett. The captain of the last ferry of the day kept the boat waiting until 100 extra ballots arrived. The boat was expected to dock shortly after 6:00 p.m. The votes of hundreds of thousands of unaffiliated Rhode Islanders are up for grabs in the state’s presidential primary. Of five states holding primaries Tuesday, it’s the only one where independent voters can select either the Democratic or Republican ballot. Half of Rhode Island’s registered voters are unaffiliated. Twenty-four of the state’s 33 Democratic delegates and 16 of the state’s 19 Republican delegates will be chosen. Most polls are open from 7 a.m. to 8 p.m. The state has one-third fewer polls open than it does during a general election. Pawtucket Registrar Ken McGill says he expects his city’s turnout to be nearly as high as the 35 percent who participated in the 2008 primary. Elections officials in Providence, Warwick and Pawtucket were reporting no major issues as of mid-day. The votes of hundreds of thousands of unaffiliated Rhode Island voters are up for grabs in the state’s presidential primary. Of five states holding primaries Tuesday, it’s the only one where independent voters can select either the Democratic or Republican ballot. Half of Rhode Island’s registered voters don’t belong to either party. Twenty-four of the state’s 33 Democratic delegates, and 16 of the state’s 19 Republican delegates, will be chosen. Most polls opened at 7 a.m. and are scheduled to close at 8 p.m. The state will have one-third fewer polls open than it does during a general election. Most top candidates have campaigned in the state. Of the five states holding a primary Tuesday, it’s the only one where independent voters can select either the Democratic or Republican ballot. Half of Rhode Island’s registered voters don’t belong to either party. Most of the leading candidates campaigned in the state in recent days. Pennsylvania, Maryland, Connecticut and Delaware also are holding primaries Tuesday. The votes of hundreds of thousands of unaffiliated Rhode Island voters are up for grabs. Of the five states holding a primary Tuesday, it’s the only one where independent voters can select either the Democratic or Republican ballot. Half of Rhode Island’s registered voters don’t belong to either party. Thirty-nine percent are Democrats. Ten percent are Republicans. The state will have one-third fewer polls open than it does during a general election. Most open at 7 a.m., and all close at 8 p.m.